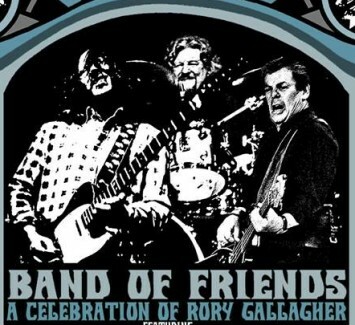 A Celebration of Rory Gallagher Featuring Davy Knowles and Gerry McAvoy. Fans of blues-rock music will likely remember Rory Gallagher, the Irish guitar virtuoso who started with the band Taste in 1969 before turning solo in 1971. Bassist Gerry McAvoy, who played on every one of Gallagher’s albums, put together the Band of Friends as a vehicle for keeping Gallagher’s music and memory alive. Knowles, who comes from a small island between Ireland and Scotland, is the quintessential triple threat: virtuosic guitarist, soulful singer and captivating songwriter.